To make the water look like it recedes into the background I need to use some atmospheric perspective. This simply means that the front (closer to the viewer) needs to be a bit different than the back (farther away from the viewer). Any drawing or painting is simply creating an illusion of reality, or whatever the artist desires to represent. I want to create the illusion of a three-dimensional space on a two-dimensional surface. To accomplish this I wet the entire area that will represent the water, or river in this case. Using French Ultramarine Blue, Antwerp Blue and a very tiny bit of Permanent Alizarin Crimson, I gently stroke a bit of color directly from the paint well, into the very wet area on my paper. 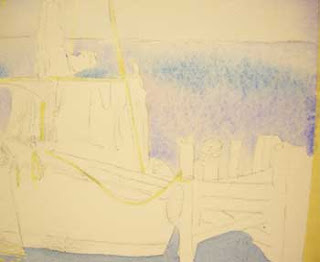 To create the illusion of depth I add more pigment to the bottom of the paper (closer to the viewer). I am keeping the distance lighter at this point. I can create more atmospheric perspective with details later on in my painting, and I will add more details to what is closer, and smaller, less defined details in the distance. 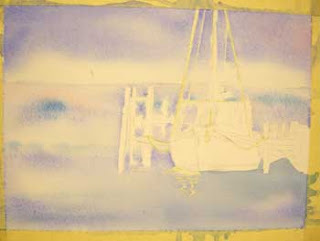 Tip your paper and allow the water and gravity to do some of the painting for you! Wherever you applied water, the pigments will flow. I used my brush to add water into the nooks and crannies around the boat and dock so the pigments would flow there as I tipped the board. If your pigment runs outside of your wetted area, quickly use a dry, clean paper towel and just press (don’t rub) onto the runaway pigment.